Instant Pot BBQ Brisket is the perfect dinner idea! Brisket will stay moist and offer loads of flavor. Combine Kosher salt, garlic powder and onion powder in a small bowl. Using a meat mallet, tenderize both sides of the brisket, then massage with Kosher salt mixture. Set aside. In a medium bowl, whisk together all ingredients for BBQ sauce including ketchup, apple cider vinegar, brown sugar, Worcestershire sauce, garlic, Liquid Smoke, chili powder, white pepper, celery salt and yellow mustard. In the inner pot of your Instant Pot, combine onion, garlic and beef broth. 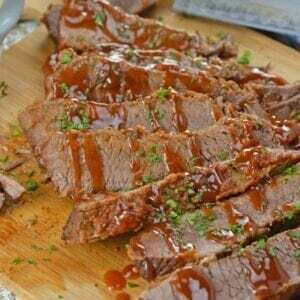 Lay tenderized beef brisket on top and then cover with 1/2 of BBQ sauce mixture, set the rest aside for serving. Lock the lid in place and set to Manual, high pressure for 60 minutes. Allow to naturally release for 10 minutes before quick releasing remaining pressure. Meanwhile, heat the remaining BBQ sauce in a small sauce pan. Keep warm until serving. Remove to a cutting board, slicing thinly against the grain. Serve slices topped with reserved BBQ sauce.